The Razorback with the most mentions this week is a former Hog baseball player now in the Red Sox lineup. But all will soon be set right. Another one of those Henry kids from Little Rock committed to play football for the Hogs. We could all use a Henry heave. And a drink. And a win. Willard Grandview: MLB has to be thrilled with this postseason. You’ve got the World Champs from Houston taking on one of the most beloved organizations in the game in Boston. Plus, a major market traditional power in the Dodgers squaring off against … Milwaukee? Oof. Three out of four ain’t bad. Truth be told, no team is hotter than the Brewers. They’ve won 11 straight games dating back to the regular season, and most recently swept the Rockies (and our old friend Taylor McGregor) right out of the playoffs. But with Clayton Kershaw on the mound for Game 1, I like the Dodgers to advance in the NLCS. As much as I want to see our guy Andrew Benintendi get a ring, I can’t pick these Red Sox to beat a star-studded Houston team that’s looking to go back-to-back. So, I’ve got Houston and LA in the World Series with the Astros winning in 6 games. Mac Garland: Willard is infinitely more knowledgeable about baseball than me, so take this for what it’s worth. The easy answer is the team representing the American League because they both won over 100 games this season. I’ll say Boston with Benintendi beats Houston and advances to beat up the Dodgers in 6 games (maybe less). Sean Casey: Chad Morris’ Hogs are showing signs of improvement on offense and defense. That and good news in recruiting gives the fans hope for the future, but that doesn’t matter this weekend. Ole Miss is coming off an easy non-conference win while the Hogs limp into War Memorial Stadium with a hangover from the Bama game. Ole Miss’s offense will move the ball well and put a lot of points on the board. Hogs fall to Ole Miss 41-28. Greg Houser: I am feeling the “left lane, hammer down” mantra! I’ve been drinking the Kool-aid since we hired Coach Chad Morris. Unfortunately, I don’t think we are ready yet. I have a feeling he still needs another year or two to get the current players to believe, and the recruits he’s getting to acclimate to SEC size and speed. I’m not sure these boys know how to win yet, and Ole Miss won’t lay down in the fourth. I’ve been wrong a couple times this year, and hope I’m wrong again. 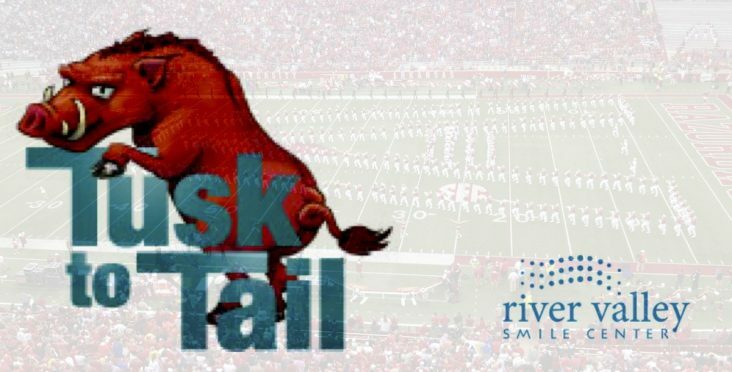 Let’s go Ole Miss 41, Arkansas 38. Todd Rudisill: The Razorbacks scored 31 on Bama. Thirty-one! And it was mainly against their starters because they did not sub out until the last couple of minutes. That is improvement whether you are a homer or not. Forget the defensive performance against the best offense in Bama history. If the defense that played so well against A&M shows up we have a decent shot at this game. The Land Sharks defense is awful. Ole Miss will get their points with QB Jordan Ta’amu putting up some yards in the air. I’m going with Hogs just because it’s been 3 weeks since we were able to even think about picking them. The 6:30 p.m. kickoff in the Rock should make it a lit crowd. I hope we can get one night game on the Hill. The tailgate gods have not been kind to us at home this year. Hogs win 41-34. Greg Houser: Is Jimbo for real in Aggie land? I think he struggles, and he’ll do slightly worse than Kevin Sumlin. A&M will dig deep for the next coach in 6-7 years. If he does get lucky and find the next Johnny Manzeil or Jameis Winston, I predict the college won’t be able to hide the next infraction. As for this Saturday, they take South Cackalacka by a touchdown. A&M 31, SC 24. Tiquan Ledwell: These teams have similarities, including both playing weak schedules. Michigan is the only team that played a ranked opponent. Michigan and Wisconsin average over 35 points a game while holding their opponents to under 17 points. But it is hard to ignore Wisconsin’s loss to BYU. It seems the Wolverines play tougher and they are at home. Michigan wins. Sean Casey: Washington enters Autzen Stadium for a game against the Ducks that promises two things: bright uniforms and lots of points on the board. Both teams can score and score quickly. Washington has the better defense, but the Ducks have home field advantage. The last team with the ball wins. Washington beats the guys in green 48-45. Willard Grandview: Just when I thought Ed Orgeron had it all figured out, he goes into Gainesville and poops the bed like Danny DeVito in It’s Always Sunny In Philadelphia. It’s seems to be a formidable challenge to go into Death Valley and beat the Tigers, but I just remembered even Bret Bielema did that so I’m going to say UGA 34, LSU 21. Todd Rudisill: Georgia has not played anyone yet. They beat mediocre Carolina and Missouri teams on the road. Georgia has really started off slow in their games and seem to play up to their level of competition. They will have to turn up the intensity earlier against LSU, or they will find themselves leaving Baton Rouge with a L. Tigers fans have not been happy that this came was made the 2:30 game instead of a night game in Death Valley. The Bulldogs sure were. Georgia will win this one in come-from-behind fashion in the 4th quarter. Dawgs take it 28-24. Tiquan Ledwell: Georgia continues to look strong under Kirby Smart even though the competition this year hasn’t been great. They have a high powered and balanced offense along with a good defense. Even in their only loss, LSU has played well this season. LSU will be ready to bounce back and will play a competitive game. Fortunately for Georgia, this game is played during the day which will reduce the significant home field advantage for LSU. Georgia will win an entertaining game.